Chief Judge of Imo State, Chief Justice Paschal Nnadi, has called Governor Okorocha to order, tacitly warning him to stop embarrassing the civilized people of Imo state by recklessly recognizing an impostor by name Ekenze Calistus as deputy governor designate, establishing that Prince Eze Madumere is the incumbent Deputy Governor of Imo State. 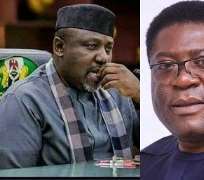 Lecturing Okorocha on request, the Chief Judge told him that in so far as the Court of Competent Jurisdiction had ruled that Prince Eze Madumere remains the Deputy Governor of Imo State, it remains so and enforceable, too. He also explained to Okorocha that his claim that he had appealed the ruling of the High Court does not in any way affect the ruling of the court that nullified the purported impeachment of Prince Madumere as the Deputy Governor of the State, thereby calling him to order to stop the impunity of parading an impostor as a Deputy Governor designate. It will be recalled that last Monday during the grand Occasion of 2018/2019 legal year and Assizes of Imo State Judiciary in Owerri, Imo lawyers, again, booed and shouted down Governor Rochas Okorocha for grossly breaching the protocol while recognizing those in his entourage. The uproar that lasted for minutes uncontrollably was caused by the Attorney-General of the State, Miletus Nlemedem who despite his presumed long years standing at the bar, in a bid to satisfy his master, introduced one Ekenze Calistus, as the Deputy Governor designate. Okorocha last month at ohakpu, Oru West local government of Imo State had also drawn the anger of Nigerians and international community when he embarrassingly introduced his aide as a deputy governor designate, leading to uproar even as some people staged a-walk-out in an event. Meanwhile, prior to the shameful showing of wrongly recognizing an impostor to Imo Judiciary at Assizes, Chief Mike Ahamba, Senior Advocate of Nigeria in his remark had reeled out catalogue of Okorocha’s violations and abuse of court orders, tacitly describing such as dangerous to democracy and an anathema to any civilized nation. The Senior Advocate enumerating Okorocha’s gross abuse of court orders mentioned incessant illegal acquisition of private property, illegal demolition of eke-ukwu Owerri among many others despite ongoing court processes. He also recalled Okorocha’s arbitrary stoppage of the process of appointing new Judges in the State, an action he said would have created eternal damage for the judiciary were it not for intervention from the commission. He described Okorocha’s unusual style as malicious governance intended to create the greatest unhappiness of the greatest number, a situation where everyone is being forced to dance to Okorocha’s crude music, insisting that only the independence of the judiciary can guarantee a true check and balances in the system to avoid the present situation in some states like Imo. He said that such can only be achieved by granting the Judiciary a Financial Autonomy. He therefore commended President Buhari for constituting a committee to facilitate its workability, urging for the immediate inauguration of the committee so as to enable them expedite action towards achieving the set goal of financial autonomy of the critical arms and tiers of government.